A smart home is a personalized system of equipment and technology designed to adapt to your routine, automate basic tasks, and streamline your day-to-day life. Combining top-of-the-line security equipment and home automation features, a Vivint Smart Home gives you unprecedented comfort and control over your household no matter where you are. Whether you’re working from home, running errands, or relaxing on vacation, you’ll have the freedom to tweak any of your home’s security or automation settings—right from your mobile device. Enjoy increased safety with a full spectrum of customizable security equipment paired with 24/7 monitoring by trained agents who watch over your home even when you’re not there. Intelligent technology, like smart thermostats, observes your daily habits and automatically adapts to your unique lifestyle. That means you’ll live more comfortably while saving on utilities. Never again worry about leaving the house with a light on, a door unlocked, or the air on full blast. Thanks to the Vivint Sky™ app, you have complete control over your smart home no matter where you are. SkyControl™ Panel: Manage all your smart home products from one, centralized hub. The sleek, minimalist design will tastefully accent your home’s decor. 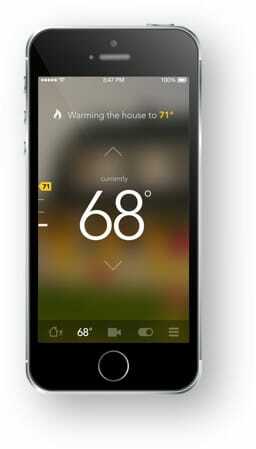 Vivint Sky™ App: Your mobile device acts as a remote control to switch on and off synced lamps, turn down the heat, or even unlock your front door. With Vivint SkyControl™ technology working for you, you get home automation on your terms. You won’t have to get out of your chair to adjust the lighting while you watch your favorite movie or turn up the heat when it gets chilly late at night. With features like voice-activated automation, you can simply speak your desired changes to Amazon Echo’s Alexa, and she’ll adjust your smart home settings to accommodate your needs. Sync all your favorite home automation products—like the Nest Learning Thermostat, Google Home, or Alexa—with your Vivint Smart Home, and you can control everything from your at-home Vivint SkyControl™ Panel or the on-the-go Vivint Sky™ app. Intelligent temperature adjustments: Simply use your Nest or Element thermostat for a few days, and your smart thermostat will learn your daily patterns and design unique temperature settings for your household. Remote equipment control: Using the Vivint Sky™ app, you can turn your lights on and off, adjust the temperature, and even close the garage door—all from your phone. Voice-activated automation: Whether you choose Amazon Echo or Google Home, Vivint syncs with both to offer comprehensive voice control over your smart home products. 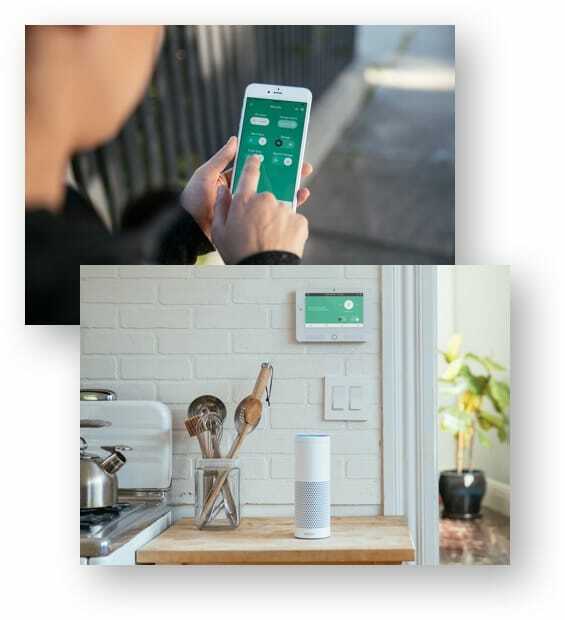 Integrates with smart home products: Vivint works with Google Home, Nest Learning Thermostat, and Amazon Echo’s Alexa, as well as offering seamless integration with the Element Thermostat, Doorbell Camera, Keyless Door Lock, and more. Smart home security systems go a step above the rest by combining top-of-the-line security equipment with home automation to guard you against intruders. With Vivint, you can activate alarms, lock doors, pan and zoom your security cameras from your phone using the Vivint Sky™ app, and even record live video clips to play back for your reference (or for police!) if an incident occurs. Vivint pairs security equipment with home automation to bring an added layer of protection to your household. Then, your smartphone doubles as a security system hub, allowing you to remotely activate or deactivate alarms, lock or unlock your doors, watch live video clips from your security cameras, or turn on a house light to help deter would-be criminals. Vivint offers a wide range of versatile security camera equipment to help keep watch over your home. Take your pick from the Vivint Ping Camera, the Doorbell Camera, Wireless Fixed Video Camera, or an HD Outdoor Camera. Every camera option allows you to view live video clips on your smartphone for added security. Vivint’s Carbon Monoxide Detector or Smoke Detectors can sense dangerous gas long before our human noses can, adding life-saving minutes for you and your family in the event of an emergency. Plenty of things can go unnoticed in a home—especially in distant, low-traffic areas like basements, high windows, sheds, and outdoor corners. Vivint’s selection of Flood/Freeze Sensors, Motion Sensors, Tilt Sensors (for sheds and garage doors), and Door/Window Sensors can help close the gap. As the final layer of security, locks and alarms alert you to danger, secure the premises, and further safeguard your household. Vivint offers the Keyless Door Lock for more streamlined and secure entry to your home, as well as alarm options for sensors and detectors. The Vivint Sky™ app helps you manage all of your Vivint home security equipment (such as the HD Outdoor Camera) and home automation features (such as the Garage Door Controller) from almost any location. Every Vivint Smart Home Security System offers 24/7 monitoring by trained Vivint professionals to help keep watch over your home. Emergency professionals can attend to the situation even if you can’t be there. Create a luxurious atmosphere in your home with smart thermostats. Designed with comfort and efficiency in mind, these intelligent thermostats memorize your daily habits and adjust temperature settings to your lifestyle, so you consume less energy while living like royalty. With intelligent home automation equipment like smart thermostats, you’re probably the most comfortable, environmentally-conscious neighbor on the block. 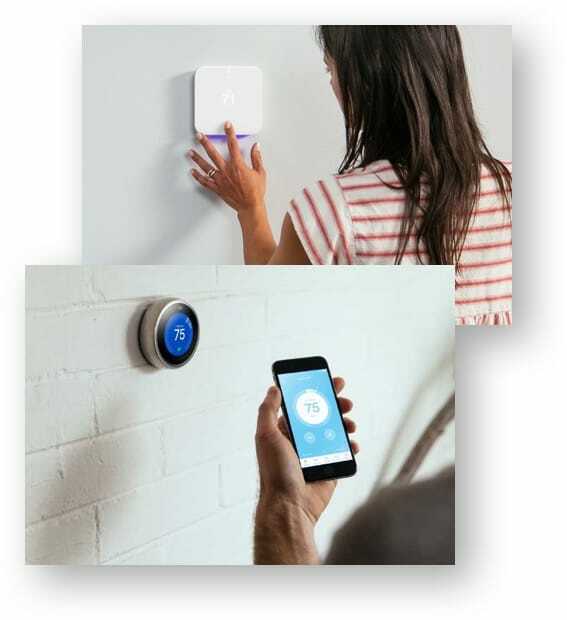 Vivint Smart Homes specifically integrate with both the Element Thermostat and Nest Learning Thermostat, so you can take your pick. These smart thermostats help create a comfy environment while offering recommendations to improve the energy efficiency of your home over time. That translates to more savings with less effort. Vivint Element Thermostat: Designed specifically to integrate with Vivint SkyControl™, the Element Thermostat adapts to your patterns and offers specialized settings to help you save energy and lower your monthly cost. Nest Learning Thermostat: By studying your daily routine, the Nest Learning Thermostat creates an automatic schedule based on your unique needs. When the green leaf is showing, you’re at the most energy-efficient temperature for long-term savings. Finally, a complete home security and automation system that helps you save money without even trying. A Vivint Smart Home uses SkyControl™ technology to sync with both the Nest Learning Thermostat and Element Thermostat. These smart thermostats provide you with an ever-temperate home while using less energy, lowering your Vivint smart home cost, and saving on your monthly utility bill. After just a few days of use, you’ll be on the road to lowering your carbon footprint and your monthly bill. Since Vivint works with many of today’s top smart home products, you can keep up with the industry’s latest innovations without worrying if it’ll jive with your current security system. Vivint even offers its own line of high-quality security equipment and home automation features designed specifically to work with the Vivint SkyControl™ system, so you can enjoy effortless integration on a whole new level. Equipped with built-in learning technology, Nest learns from your daily temperature adjustments and programs your preferences in the most energy efficient way, so you can go green while saving on your monthly bill. Simply ask “Alexa” to turn up the heat a couple degrees or lock the door behind you when your hands are full of groceries. With this voice-activated technology, you can manage all your smart home products without lifting a finger. Run by “Google Assistant,” Google Home acts as your home equipment-synced Siri, allowing you to ask questions and speak commands to an array of products—like Nest, Spotify, and Vivint’s line of equipment—for complete at-home voice control. Featuring a sleek design and using Smart Assistant to adapt to your daily patterns, the Element Thermostat is uniquely designed to integrate with Vivint SkyControl™, offering settings for home, away, sleeping, or vacation for maximum energy savings. Check to see who’s at the door—and even talk to them—whether you’re in the back room or miles away with the Doorbell Camera. Your mobile device acts as a window into your porch, so you can talk with a salesperson or tell the mail delivery person to leave your package at the door. There’s no more need for a keychain. With a Keyless Doorlock, you can use your smartphone to lock and unlock your front door, let in your kiddo’s friends when you’re not there, and get mobile notifications whenever your door is left unlocked. Now that you’re a smart home expert, it’s your chance to get a personalized quote for a Vivint Smart Home! Fill out the form, and a Vivint specialist will give you a call to provide you with an estimate and chat through the best options for your household. Or call 1-844-661-0146 today to connect instantly.